all along the Konkan Coast, stretching from Kerala to Gujarat, is undoubtedly the arrival of Lord Ganesh in many homes, venerating him across faiths. Lord Ganesh is surmised as the son of Lord Shiva and Sri Parvati. In every Hindu home, every new venture commences, first, by holding a ritual to appease Lord Ganesh. The day that Ganesh Chaturthi festival starts, is from the fourth day of the dark half of the Hindu Lunar Calendar Month of Bhadrapada. Usually this Hindu calendar month of Bhardapada, coincides with the Gregorian calendar months of either August or September, in the prime monsoons. Festivities are held, with pomp and gusto, in each home for a day and half, for 5 days, 7 days, 11 days or 21 days, as per their ritualistic vows and convenience. A day previous to this date, the third day, also called as “Hartalika Tritiya”, a beautifully painted, clay made idol is ceremoniously brought home, much to the delight of children of the house. When getting it home from the artistes shop, called as “Ganesh Chitra Shala” literally translating to “Ganesh’s Art School”, it is customarily covered with a cone of paper or a crochet wrap. The children were not allowed anywhere near the idol; and peeping under the cover was taboo. This aspect, of covering the idol while bringing it home and keeping it covered till the auspicious time, has always been a cause of curiosity for me since childhood. This mystery unwrapped itself to the writer, only recently in the last few years. It brought a smile to my lips. It had the most simple and logical explanation! To keep the idol from any defilement from the muddy rain water or to protect it from any bird droppings, the idol was covered. And as regard the taboo of children ‘not peeking under this cover,’ - the reason was more practical. Children, especially during this festive season, are always in a hyper excited mode. Any casual tryst with this idol, which could lead to its fragile clay being damaged, would lead to rejection of the same, for ritual purposes. In Hindu rituals, no idol which has cracked or broken is used for rituals! Hence, children were kept away from the Ganesh Idol. The mystery of the idol being covered takes rest! It is the personal belief of the writer, shared by many litterateurs, who theorises that ‘Ganesh Chaturthi has nothing to do, specifically with Lord Ganesh, as a deity’. 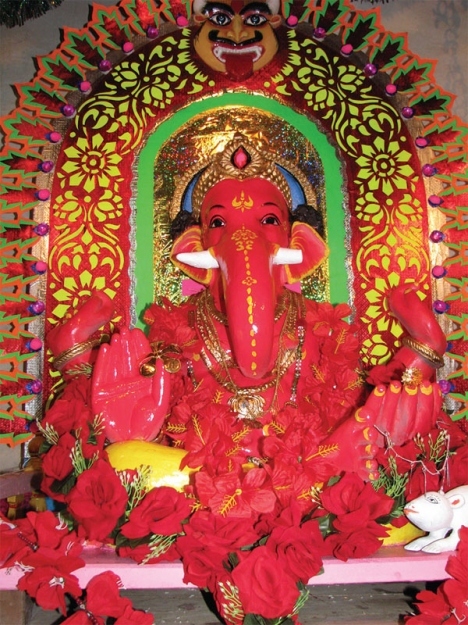 Though in all humility and in all sincerity, collective rituals are carried out daily, in praise of the Lord Ganesh, it is felt that our wise ancestors had a different well meaning, hidden agenda, for instituting this specific festival, caring for the welfare of the society at large and the interests of its people, in mind. Another aspect of positively considering this theory is that, if it was the ritualistic festival of Lord Ganesh, then the idol would not be immersed after the above mentioned days, but would have been kept in the home itself, like all other deities, whose rituals and puja is carried out daily. Or, if needed, a framed picture of the deity would have been used! But that beside the point, it is strongly theorized that this festival was instituted, by our wise ancestors, for reasons far more significant, than the religious ones! The first message, which has permeated down centuries, regarding this ritual or festival, is to use “Eco-Friendly materials” in all our daily needs and as many of our other requirements. It is seen that the Ganesh idol is made of clay, from Mother Earth. It is eco-friendly and after pertinent usage and immersion, blends and becomes one with nature, without harming it. To justify the above theory, of this festivity being instituted, not with the primary intention of Ganesh ritual, four interpretations are placed here below for logical scrutiny and unprejudiced analysis. The most important and primary rationale observed, in which our “Budhvant” ancestors displayed appreciable foresight, with respect to Ganesh Chaturthi, was to create a platform for a healthy future, which would bring together the far-flung families and family members, at least once a year. We have to understand that in the initial era, almost all families in Goa, and so also the Konkan belt, traditionally resided together, as a “Joint Family”. The wise ancestors’ were aware of changing times and knew that the enlarging families, restriction of space, the need to earn or just simple family bickering, would lead to family members setting up house elsewhere - in or out of the village. It was an unbeatable fact that the “Joint Family” of the old era, would lead to “Satellite Families”, far away from their ancestral lands. These wise elders, possibly and very astutely, may have instituted this festivity, including Lord Ganesh as its integral part, monopolising on the “God-Fearing” aspect of the local populace. It was possibly their positive intent, to make a real time effort, to bring all family members and siblings together under one roof, just like the happier old times, with a pure intention to bond and revive their relations. Today, many houses, such as our Suryarao Sardesai Ancestral House, in Savoi Verem Ponda, celebrates Ganesh Chaturthi, with a strict condition that there shall be only one Ganesh idol, and no individual family of Sardesai’s shall commence a Chaturthi ritual on their own, separately. It is heartening to meet all the relatives, all at one place and spend two days in their company and break bread with them. This Ganesh Chaturthi festivity also creates a healthy environ for the new generation children, to meet and exchange annotations with their blood relatives, whom they would, under regular circumstances and in their hectic schedules, would never meet or get to know. Having said this, this festivity is also a meeting place for all the Mothers, Daughters, Mother-in-laws and Daughter-in-laws of all the arriving relatives. This healthy meeting of the bouquet of ladies, under one roof, leads to a strengthening of family bonds, as they are found to animatedly interact with each other, leading to building of healthy bridges between far flung families. The ladies having met and spent the day together, leads to the tertiary objective of hosting this Ganesh Chaturthi. These ladies lend a helping hand in the mega kitchen for the day, and it is an opportunity for the new daughter-in-laws to learn from these experienced elders and also show their own prowess to teach the elders some new cuisines. Not to be mixed with “Old horses doing new tricks”! However, in light of these traditional culinary dishes being made with age-old style and pure vegetarian recipes, without onion and garlic, helps these fading recipes from the Hindu kitchen to survive and be transmitted to the generation next. Sadly, such events are not being promoted, in their right perspective, by administrative authorities that are expected to promote tourism in Goa. It is surprising to hear statistics about a large chunk of the ever-growing footfall of incoming annual visitors to Goa, being “Vegan”, or that they are tilting towards healthy vegetarian food. Goa can offer, through its local populace, some of the most relishing, finger-licking and highly enriched Saraswat and regional vegetarian culinary dishes, besides Portuguese influenced dishes, which even the premier Chefs of any of the Star Resorts, will find no stamina to catch up with! However, the Goans are left despondently, as hapless spectators to high placed players in the so-called tourism industry, foolishly belting out foreign dishes to foreigner visitors, when it is imperative that these foreigners have come to Goa, to experience our local Goan culinary delicacies and culture. May Lord Ganesh, grant good wisdom, to those concerned, to love our own Goan vegetarian cuisine - protect it, preserve it and promote it! Ganesh Chaturthi, and related festivals of Goa, offers a huge platform for the tourism industry, and these high potential opportunities are wasted, just like the inestimable water, flowing unused under the bridges of Goa. But the fact that such festivals are helping to preserve the local authentic vegetarian cuisine, though at a family level, is like a cool shower on a hot summer day! It was the movie on silver screen “The Vinci Code”, which evoked a colossal interest in the Renaissance artistes, painting hidden messages in their works. In Goa too, during the Ganesh Chaturthi, many of us fail to see and observe the stark truths and interesting messages, in the form of colourfully intertwined ritualistic inclusions, which can be exploited as solutions for our health problems and survival. Nature has all the solutions to the human race. But it is the incompetency or ego of this human which creates a barrier or a negative ambience of the phenomenon “Water, water everywhere; but not a drop to drink”. At a time, when the health of the world’s population is presenting a rise in epidemics and personal health deteriorations, it is observed that jungles are being maliciously mowed down to create spaces for concrete jungles. The advent of toxic smoke emitting factories and harmful chemical spewing industries are getting priority over human lives, leading to the need for medical facilities over-shooting their targets. In the present jet set world, individuals want a speedy remedy, to catch up with their demanding schedules. In turn, the intake of chemicals leads to a larger damage and side-effects. But in the preceding millennia, and the one before that, we see a total absence of the need for these mechanical and chemical monsters! In the old era, and with the teachings of “Ayurveda”, every, if not all disease was found a cure, with herbs made of leaves, barks and roots of wild plants and shrubs. The present scenario of balding mountain sides, cut and bleeding, to accommodate mega housing projects, these wildly growing and medicinally rich herbs are going behind the curtain of time. One salvation, that we in Goa could rely on, was that the daily intake of our local culinary recipes and the use of various herbs and spices, such as turmeric, amla, tamarind, pepper, local salt, etc in their preparations, built a strong immunity towards many viral and bacterial ailments. This rich home cooked food, coupled with the intake of locally available wild fruits, found on mountain sides, led the earlier generations to withstand most of the diseases. Let us relate it to Ganesh Chaturthi and its rituals. Lord Ganesh, it is said, loves the raw shoots of the “Durva” (Cynodon dactylon), a fine lawn grass, that is found to be a hardy plant that grows, even after being continuously trampled upon. A legend informs us that after annihilating a fiery demon, Analasura, by gobbling him up, Ganesh started feeling uneasy and as though raging heat was building up in him. After trying all divine therapies, no antidote could help him relive or subside the discomfiture of internal heat. But it was some Sages who offered him “21 Durva” shoots, the results of which gave him immediate relief. It is said that after this mythological medication gave him relief, Ganesh decreed that he should be offered these “Durva” shoots during his ritual; a custom that is followed in all Ganesh Temples, till date. In the legend, the mention of the name “Durva” gives us a picture that it has very high curative powers on the human body. It is hearsay that drinking the juice of these fresh “Durva” shoots it can even control dreaded disease like the life threatening cancer. It is also hearsay that, 21 denotes three weeks of usage to seek a cure, hence 21 Durva’s. Any Ayurvedic Doctor may be able to throw more light, on this aspect. But till then, we can observe our pet canines and felines, eating this lawn grass, when they are ill. If they know the curative aspect naturally, then we too should find out more about this grass, loved by Lord Ganesh! Whatever be the reason, this myth has led to the compulsory survival of this “Durva” or Cynodon dactylon grass! During Ganesh Chaturthi, one more mystery, enveloped in mythology, yet difficult to understand is the tying of the “Matoli”, over the head of the Ganesh idol. This is originally a wooden grid frame, exactly above the head of Lord Ganesh idol, tied with “local fruits” from the garden and filled with “specific wild herbs” found on the mountain sides as shrubs, creepers and trees. Every year, just before the Ganesh Chaturthi, there is a special temporary market fair that takes places called as “Matolecho Baazar” or ‘market for the Matoli fruits’. During this fair, one can lay eyes on some fascinating coloured wild fruits - sold singularly or in bunches, and hosting captivating shapes. These are purchased by the hundreds of people, who celebrate Chaturthi to take home and tie to their respective “Matoli’s”. You can hear the names like, “Kangla’an”, Ghungroo”, “Karathi’n”, Ghonsale” (Ridged Gourd), “Ambade” (Hog Plums), “Sitaphal” (custard apple), “Chickoo” (Sapota), “Jaiphal”, “Bedde” (Betelnut), Ida-limboo, Torinz, etc. In the village of Sonal in Sattari, one can see an astounding number of about 375+ different wild herbs and fruits tied decoratively to a “Matoli”. Nowadays, we see new imported fruits being tied to the “Matoli” and which is a distressing divergence from the traditional requirement. It is the final aspect of the theory that our ancestors wanted us to preserve these life saving herbs and fruits, growing on our hills and in forests, so that we could help tide over any diseases. However, in their wise wisdom, they must have realised that if they had to inform us frankly about these fruits and their importance, then we would not have taken heed of their words. Today, we are aware about the fate of Galileo, almost 350 years ago, who was put to death, because he theorized that the Sun was still and the Earth moved around it; and that the Earth was round and not flat as was being prophesized. So they being positively calculative, wrapped this health related medical aspect, in religious rituals and requirement, so that we would be forced to preserve these herbs and plants in the centuries to come, having a need for religious rituals. Most of the religious festivities celebrated in Goa, by all faiths, have a similar, well meaning reason to respect Mother Nature. Our ancestors were wise, though far away from modern techniques. The lessons that they have left for the generations that followed, are wrapped in the form of mythological stories and religious rituals. They understood the language of Mother Nature and interpreted and lived by the instructions received. Today, we are aggressively doing away with the lush greenery and the treasure of its herbal wealth. Our dependency on chemicals and allopathic medicines is increasing. It is these festivals, such as Ganesh Chaturthi, Touxanche Fest, Jaiyanchi Puja, Pezeche Fest, etc which are offering us a solution to many of our problems, and that too, on a golden platter. We need to learn from such ancient rituals and myths and not take them for granted. Ganesh Chaturthi brings along joy and gaiety, along with the idol of Lord Ganesh as it arrives in the homes of people in Goa. It is time to use this festival to bond the peoples of various religions and faiths by visiting these houses, meeting the people and joining them in sharing a meal and the traditional sweets. May this Chaturthi festival bring prosperity and health to all!